2003-05-12 Assigned to SILICON VALLEY BANK reassignment SILICON VALLEY BANK SECURITY INTEREST (SEE DOCUMENT FOR DETAILS). Assignors: LAYER N NETWORKS, INC.
2004-11-05 Assigned to BRITESTREAM NETWORKS, INC. reassignment BRITESTREAM NETWORKS, INC. CHANGE OF NAME (SEE DOCUMENT FOR DETAILS). Assignors: LAYER N NETWORKS, INC.
2007-05-07 Assigned to NCIPHER CORPORATION LIMITED ACTING BY AND THROUGH ITS WHOLLY OWNED SUBSIDIARY, NCIPHER, INC. reassignment NCIPHER CORPORATION LIMITED ACTING BY AND THROUGH ITS WHOLLY OWNED SUBSIDIARY, NCIPHER, INC. ASSET PURCHASE AGREEMENT (ATTACHED) Assignors: BRITESTREAM NETWORKS, INC.
2012-09-25 Assigned to THALES HOLDINGS UK PLC reassignment THALES HOLDINGS UK PLC ASSIGNMENT OF ASSIGNORS INTEREST (SEE DOCUMENT FOR DETAILS). Assignors: THALES E-SECURITY LTD.
A data encryption method performed with ring arithmetic operations using a residue number multiplication process wherein a first conversion to a first basis is done using a mixed radix system and a second conversion to a second basis is done using a mixed radix system. In some embodiments, a modulus C is be chosen of the form 2w−L, wherein C is a w-bit number and L is a low Hamming weight odd integer less than 2(w−1)/2. And in some of those embodiments, the residue mod C is calculated via several steps. P is split into 2 w-bit words H1 and L1. S1 is calculated as equal to L1+(H12x1)+(H12x2)+ . . . +(H12xk)+H1. S1 is split into two w-bit words H2 and L2. S2 is computed as being equal to L2+(H22x1)+(H22x2)+ . . . +(H22xk)+H2. S3 is computed as being equal to S2+(2x1+ . . . +2xk+1). And the residue is determined by comparing S3 to 2w. If S3<2w, then the residue equals S2. If S3>2w, then the residue equals S3−2w. All references cited hereafter are incorporated by reference to the maximum extent allowable by law. To the extent a reference may not be fully incorporated herein, it is incorporated by reference for background purposes and indicative of the knowledge of one of ordinary skill in the art. A preferred embodiment is a data encryption method performed with ring arithmetic operations using a residue number multiplication process wherein a first conversion to a first basis is done using a mixed radix system and a second conversion to a second basis is done using a mixed radix system. In some embodiments, a modulus C is be chosen of the form 2 w−L, wherein C is a w-bit number and L is a low Hamming weight odd integer less than 2(w−1)/2. And in some of those embodiments, the residue mod C is calculated via several steps. P is split into 2 w-bit words H1 and L1. S1 is calculated as equal to L1+(H12x1)+(H12xk)+ . . . +(H12x1)+H1. S1 is split into two w-bit words H2 and L2. S2 is computed as being equal to L2+(H22x1)+(H22x2)+ . . . +(H22xk)+H2. S3 is computed as being equal to S2+(2x1+ . . . +2xk+1). And the residue is determined by comparing S3 to 2w. If S3<2w, then the residue equals S2. If S3>2w, then the residue equals S3−2w. Further features and advantages of the invention will become apparent from the following detailed description and accompanying drawings. FIG. 4 shows a flowchart of a castout process, in accordance with an embodiment of the present invention. The two large prime numbers p and q are used to generate the members of a key pair. The product is computed: N=pq. An encryption key e is chosen such that e and (p−1)(q−1) are relatively prime. The decryption key d=e −1 (mod (p−1)(q−1)) is computed from e using the extended Euclidean algorithm. For a plaintext message S, a ciphertext message A is created by computing A=Se mod N. Then computing S=Ad mod N decrypts ciphertext A, giving plaintext S.
The Residue Number System (RNS) can be used to improve efficiency. Given a list of pair-wise relatively prime moduli m 1, m2, . . . mk, called an RNS basis, the RNS representation of a number X with respect to this RNS basis is the k-tuple (x1, x2, . . . xk) where xi=X mod mi. The importance of the residue number system to numerical processes is that the operations of addition, subtraction, and multiplication modulo M (where M is the product of the moduli) can be performed without the use of carry operations between the moduli. In other words, each coordinate in the k-tuple can be operated on independently and in parallel. CRT may be stated as follows. For a given list of positive integers m 1, m2, . . . mk such that the greatest common divisor (gcd) of any pair mi, mj(i≠j) is 1, then for any list of non-negative integers r1, r2, . . . rk such that ri<mi(i=1, k), there exists a unique integer X such that X (mod mi)=ri(i=1, k) and X<m1 m2 . . . mk, and conversely, each such X determines a unique such list of ri. Thus the problem of calculating S=A d mod N where A, d and N are 2n bit numbers, is reduced to one of calculating two values sp and sq which are n bit numbers. This represents a considerable saving in computation time. Suppose two numbers are to be multiplied. First, they are each transformed into Montgomery space by taking mod p of each. Then the Montgomery multiplication is carried out, and its result is inversely transformed out of Montgomery space. The transformation and inverse transformation each have a processing load of about one multiple-precision multiplication. Consequently, modular exponentiation suffers lower overhead due to the Montgomery conversion and the inverse Montgomery conversion because it carries out modular multiplications repeatedly and therefore it can be realized by a fast implementation. The Montgomery method can benefit many public key algorithms, including RSA, that use modular exponentiation, S=A d mod N, as their basic operation. But the Montgomery method will not necessarily lead to efficient implementation if only some multiplications are required due to transform and inverse transform overhead. FIGS. 1A and 1B depict a shotgun multiplication process. The processing occurs in parallel mathematically independent units. In a precomputation phase  12 mi, M, and W are defined 14. The mi are k-bit moduli (m1, m2, . . . m2t), where the moduli mi are pairwise mutually prime and t ≧(n+1)/k, where n is the bit length of the numbers being multiplied. M is defined as the product of the first t moduli: M=m1m2 . . . mt. W is defined as the product of the second t moduli: W=mt+1mt+2 . . . m2t. By k-bit moduli, we mean 2k-1≦mi <2k. This means that M >2n+1 and W >2n+1. Additionally, mi −1 mod mj are calculated for i,j=1 . . . 2t with i≠j. During the precomputation phase  12, pi is also defined 16 such that p is an n-bit number and pi=p mod mi for i=t+1 . . . 2t. Additionally, p−1 i is calculated for i=1 . . . t. Note that p must be relatively prime to M and W, and p is usually prime. During a setup phase  18, Ai and Bi are defined 20 for n-bit numbers A and B. To multiply A and B modulo p, the numbers are rendered in RNS notation so that Ai=A mod mi and Bi=B mod mi and pi=p mod mi for i=1 . . . 2t in both RNS bases. The rest of the shotgun multiplication process depicted in FIGS. 1A and 1B all falls within the body phase  22. 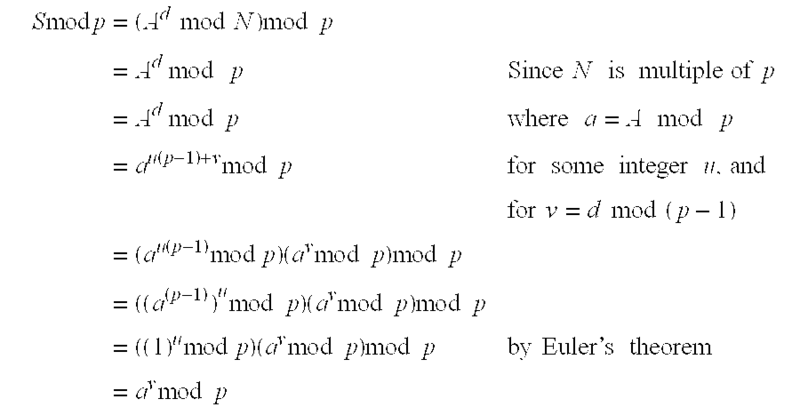 It takes as parameters arguments A and B from  20 and modulus p in Residue Number System (RNS) notation from 16 for a first RNS basis (moduli m1, . . . mt) and for a second RNS basis (moduli mt+1, . . . m2t) from 14. Its output 40 is R=ABM−1 mod p expressed in the both the first and the second RNS bases. This allows the outputs 40 to be used as inputs in subsequent multiplications. As in 14, M is the product of the moduli in the first RNS basis. And as also in 14, W is the product of the moduli in the second RNS basis. The strength of this process lies in the fact that there are many operands that do not depend on A or B, depending only on p or the m i. These operands can be precomputed one time for many different p in the same size range and stored for repeated reference. The set of Q i's is the set of RNS values corresponding to Q=−ABp−1 mod M. The RNS values Qi are computed as Qi=−AiBip−l i mod mi for i=1 . . . t in 24. Note that the Qi's are computed without reference to Q, and p−1 mod M is a precomputed value as described above. In Steps  26-30, Q is then converted from the RNS basis (m1, m2, . . . mt) to RNS basis (Mt+1, Mt+2, . . . m2t) by computing the MRS expansion Q=Q#1+Q#2m1+Q#3m1m2 + . . . +Q#tm1m2 . . . mt−1. To perform this expansion, Qi=0 for i=t+1 . . . 2t. Q#1=Q1. Counter j is set to zero. In step  28, the counter is incremented: j=j +1. Q i=Qj+Q#j(m1m2 . . . mj−1) for i=t +1, . . . 2t. Then the process returns to step  28, where the counter is again incremented, etc. But if, in step  29, j is greater than t, the conversion of Q to the second basis is complete, i.e. Qi=Q mod mi, for i=t +1 . . . 2t. Then in  31 the set of Ri's is the set of RNS values corresponding to R mod p=ABM−1 mod p. The RNS values Ri are computed as Ri=(AiBi+Qipi)(M−1) mod mi for i =t+1 . . . 2t. Note that the Ri's are computed without reference to R. Also note that (M−1) mod mi is also a precomputed value. Because this multiplication process is used recursively when doing exponential operations, R is converted from the second RNS basis (m t+1, mt+2, . . . m2t) to the first RNS basis (m1, M2 . . . mt) by computing the MRS expansion R=R#t+1+R#t+2mt+1+R#t+3mt+1mt+2+ . . . +R#2tmt+1mt+2 . . . m2t−1. Then in  32, Ri=0 for i=1 . . . t. R#t+1=Rt+1. Counter j is set to t+1. In step  34, the counter is incremented: j=j +1. R i=Ri+R#j(mt+1mt+2 . . . m2t) for i=1 . . . t.
Then the process loops back to step  34, where the counter is again incremented and so on. R i=(ABM−1 mod p) mod mi, for i=1 . . . 2t. If another iteration of the shotgun multiplication process of FIGS. 1A and 1B follows, then this R i would go into the subsequent shotgun multiplication iteration. The subsequent iteration would include body 22, with the Ri being used in place of Ai. Step 2( a): Appropriately operate on the F-shards of the members of Z/mZ involved in the first operation. Do this separately, for each F, so as to accumulate a family of result-shards corresponding to the first operation of the desired succession of operations, one result-shard belonging to each factor ring F.
Step 2( b): Remain at the shard level, and do the next appropriate operation within each factor F, producing a next family of result-shards, one for each F.
Step 2( c): And again. And again. . . . Never departing from the shard level, which is to say from operations with each single factor ring F.
FIG. 2 depicts a method for exponentiation mod prime p through repeated squarings and multiplications. This flow introduces data, specifically the m i moduli that are essential in the shotgun multiplication process used in each of the demarcated boxes. A shotgun multiplication process is detailed in FIGS. 1A and 1B. The exponentiation method ultimately calculates Ad mod p.
In  42, message A has a bit length of n bits. The message A could be any number or other information represented in a digital format. Method parameters are shown in 44. In 46, k-bit moduli (m1, m2, . . . m2t) are chosen, where the moduli mi are pairwise relatively prime and t≧(n+1)/k. And also in 46, M is defined as the product of the first t moduli: M=m1m2 . . . mt. As a first part of a key  48 a modulus p is input 50, where p is an n-bit prime modulus. In  52 the message A and modulus p are rendered in RNS notation so that Ai=A mod mi and pi=p mod mi for i=1 . . . 2t. The modular inverse of p is also calculated p−1 i=p−1 mod mi for i=1 . . . 2t. The second parameter  44 is a sliding window width s shown in 53. The sliding window width s is chosen (and fixed for a given implementation) by weighing the cost of storage ˜t(k)(2s) bits against the cost of computation ˜2s+n+n/s multiplications. Sliding window widths in the range of 1 to 6 would be common. As a second part of key  48, input 60 is a 2n-bit exponent d. In 62 a variable c is set equal to d mod (p−1). And in 64 variable pointer cbits is set equal to the number of bits in c.
In step  65, a variable b is set equal to the first s bits of c. In step 66, a variable Ti is set equal to Lbi. The determination  68 is then made of whether there are more bits in c to process. If yes, then in 70 b=s bits of c, starting at cbits. Then in 71, cbits=cbits-s. The shotgun multiplication process is repeated s times in  72, each time setting T=T2M−1 mod p, where Ti=T mod mi, wherein T is realized in RNS notation, Ti=T mod mi, i=1 . . . 2t. The shotgun multiplication process is then used in 74 to set T=TLbM−1 mod p, wherein T is realized in RNS notation, Ti=T mod mi, i=1 . . . 2t. The method then loops to make determination  68 again and so on. If the determination  68 is no, the shotgun multiplication process is used in 76 to set T=TMdelta(c) mod p, wherein T is realized in RNS notation, Ti=T mod mi, i=1 . . . 2t, and wherein delta(c) is the number of powers of M−1 accumulated in the shotgun multiplications, including squarings, in the 68-70-72-74 loop. Because delta(c) is solely determined by c, it can be precomputed. Finally, in  78 T is recovered from Ti using the Chinese Remainder Theorem (CRT). In fact, T=Ad mod p.
The process begins in  80 with a 2n-bit message A. Then a key 82 is chosen 84. The components 84 of key 82 include n-bit prime numbers p and q, and a 2n-bit exponent d.
Then the sliding window exponentiation process is used in  88 to compute AP d mod p in 90 and Aq d mod q in 92. Finally in  94, Ad mod (pq) is constructed using CRT. The shotgun multiplication method can be used more efficiently by choosing the bases (m 1, . . . m2t) in ways that make the modular calculations simpler. A w-bit number C is a “castout modulus” if it is of the form 2 w−L, where L is a low Hamming weight odd integer less than 2(w−3)/2, i.e., C=2w−2x2− . . . −2xk−1, where (w−3)/2>x1>x2> . . . >Xk>0 and k is much less than w. The “castout order” of C is defined to be one less than the Hamming weight of L.
The residue of a modulo <2 2w a w-bit castout modulus can be found using only 2k+3 additions, 2k multiplications by 2x(shifts) and a single bit comparison, where k is the castout order of the modulus. C 2w−2x1−2x2 − . . . −2xk−1. And let P be a number < 2w in 98. P=2wH1+L1, with L1 <2w and H1 <2w. Computation of S 1 and S2 take k +1 additions and k shifts each. Computation of S3 takes one addition, and the decision on what to output is a one-bit comparison. These total 2k+3 additions, 2k shifts and one one-bit comparison. In order to find the residue, modulo C, therefore, it is only necessary to calculate  104 S1 using Step 1 in 102, calculate 110 S2 using Step 2 in 106, calculate 114 S3 using Step 3 in 112 and perform a one-bit compare 118 of S3 against 2w and output either S3−2w in 120 or S2 in 122, depending on the result of the compare 118. A definition of a “w-big” number used by some embodiments is: a w-big number is a number less than 2 w but close to 2w. A definition of a “w-heavy” number used by some embodiments is: a w-heavy number is a number less than 2w and with Hamming weight close to w.
A definition of a “w-little” number used by some embodiments is: a w-little number is a number greater than 2 w but close to 2w. A definition of a “w-light” number used by some embodiments is: a w-light number is a number greater than 2w and with Hamming weight close to 1. Another definition of a “w-big” number used by some embodiments is: a w-big number is greater than >2 w−2gw, where g is a number less than 1. That is, the upper w(1−g) bits of the w-big number are 1 when the w-big number is written in binary notation. For example, one embodiment defines a w-big w-heavy number by g=½ and |x−w|≦6. converting to a second basis using a mixed radix system. A2. The method of claim A1, wherein the ring arithmetic function includes multiplication. A3. The method of claim A1, wherein the ring arithmetic function includes addition. A4. The method of claim A1, wherein the ring arithmetic function includes subtraction. A5. The method of claim A1, wherein the data is encrypted using asymmetric encryption. A6. The method of claim A1, wherein the data is encrypted using symmetric encryption. wherein the modulus C is w-heavy. wherein L is a low Hamming weight odd integer less than 2(w−1)/2. wherein the modulus C is a residue. wherein the modulus C is w-light. wherein the modulus C has a Hamming weight close to 1.
computing R in the second basis, R mod W, wherein R=(AB +Qp)M−1 mod W and R mod p=ABM−1 mod p.
B2. The method of claim B1, further comprising converting R to the first basis, R mod M.
wherein R is used as input to the subsequent iteration. B4. The method of claim B1, wherein the data is encrypted using asymmetric encryption. B5. The method of claim B1, wherein the data is encrypted using symmetric encryption. wherein L is a low Hamming weight odd integer less than 2(w−1)2. E2. The method of claim E1, wherein the ring arithmetic function includes multiplication. E3. The method of claim E1, wherein the ring arithmetic function includes addition. E4. The method of claim E1, wherein the ring arithmetic function includes subtraction. E8. The method of claim E7, wherein the method of hashing data comprises a method of cryptographic hashing.